What’s interesting is that searchers don’t use many words in their queries. According to data from Jumpshot, a typical searcher uses about 3 words in their search query. Google’s job is to interpret what they want. 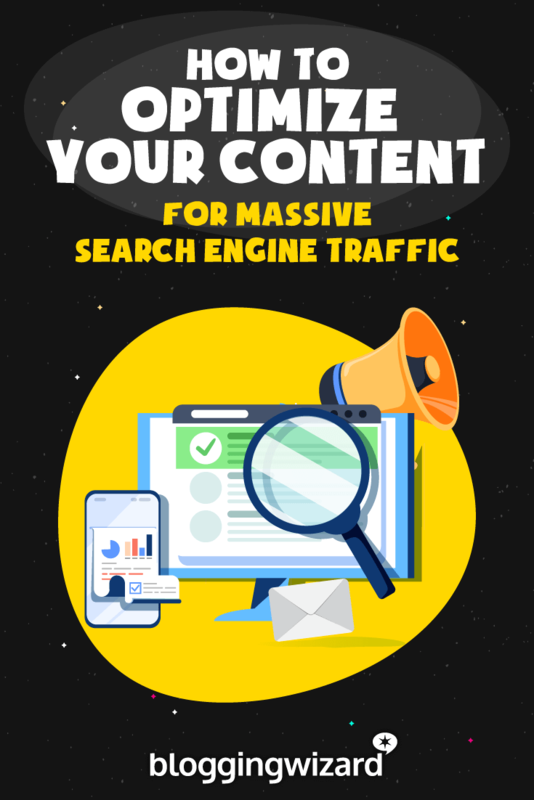 Your task is to make sure your content is relevant to that search query. Why? Because 51 percent of all website traffic comes from organic search, and 39 percent of purchasers are influenced by a relevant search. In this article, we’ll explore further how you can optimize your content to match search intent. But let’s start with a quick look at what search intent is. Is your content optimized for search intent? Search intent, sometimes referred to as keyword intent, is the underlying reason behind a search query. In other words, when you enter a search term in Google, what are you really searching for? You might be looking for some background information, or you might want to buy a product. That’s search intent. More than 80 percent of search queries are informational, while navigational and transactional have about 10 percent each. 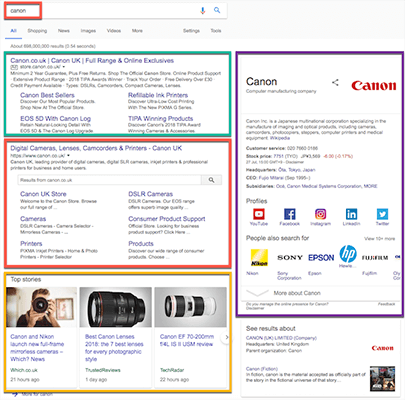 Google recognizes the search intent and displays the Canon website (highlighted in red). 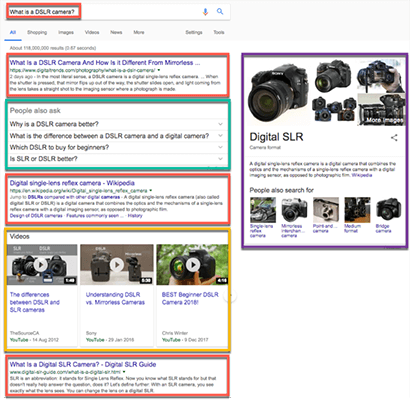 Surrounding it are other SERP features including an Adwords advert (green), some Top Stories (yellow), and, on the right-hand side, a Knowledge Panel (purple). 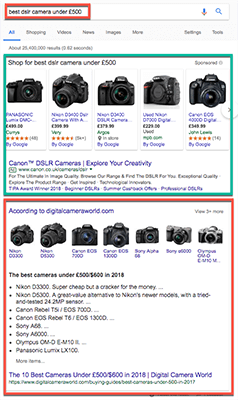 An additional bonus for Canon is that Google has enhanced the search results with Sitelinks. Google displays these extra links to help searchers go to specific sections of the website from the SERPs rather than via the homepage. For example, you could go directly to Printers or Cameras. Also, notice that the results are UK-specific. Canon is a multinational company, but Google serves location-based results. Why do I need a DSLR camera? How do I choose a DSLR camera? Google displays three organic results that answer the question (red). Other supporting results include Related Questions (green), Videos (yellow), and the Knowledge Panel (purple). Notice there’s no Knowledge Panel this time, as there’s no need for information. 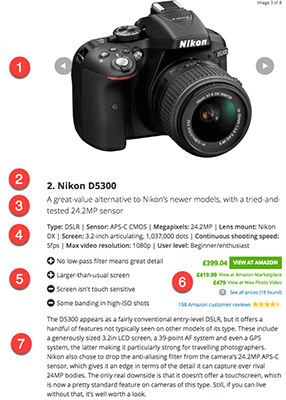 Google delivers action-based buying results with a Featured Snippet (in red) listing the best DSLR cameras under £500. At the top of the page (in green) there is a Shopping Ad (Product Listing Ads) and an Adwords Ad. As you can see from the examples above, search engines are sophisticated enough to interpret search queries, decide what the intent is, and display relevant results. All you have to do is ensure your content matches the search intent. Now you know the background to the different types of search intent, you can tailor your content accordingly. Let’s take a look at how you can do that for each one. For each search intent, we’ll examine the page format and the search engine meta tags – Title, URL, and Description – that appear in the search results. Also, note that Google sometimes overrides a site’s meta description with other content from the article. You’ll also need to know about the heading tags that are used in WordPress and other word processing documents like MS Word and Google Docs. HTML Heading tags help format the page content. The default text is called ‘Paragraph’, sometimes referred to as the ‘body’ of the text. And then there are six heading tags with Heading 1 (H1) being the most important and therefore usually the largest size. Heading 1 is used as the Title in WordPress. The other headings are used as subheadings. The headings help break the text on a page into chunks, so it’s easier to read. And they also help search engines to understand the hierarchy of the content. In other words, they’ll attach more importance to an H2 heading than an H3 heading. The key to optimizing for navigational intent is to ensure you have landing pages for your brand, products, services, and other offerings, as well as your homepage. You need to optimize each page using your product or brand names in strategic positions like the page title, subheadings, and meta descriptions. Example: Here’s how Canon optimized their homepage for navigational intent. 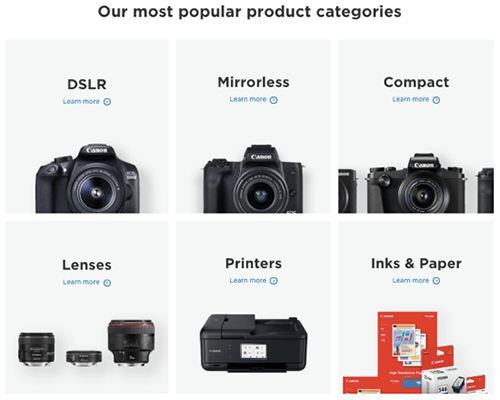 Canon has placed product keywords in their title, so it’s immediately obvious what their site is about, and included their company name at the end. Because this is a homepage, there are no additional slugs (like you’ll see later) that can be optimized in the URL. The description expands slightly on the product categories and confirms they have both consumer and business options. It’s a succinct, but powerful way of saying what they do and who they serve. That’s what searchers want to know. As we saw above, informational intent usually involves questions like “How to” or “What is”. Therefore, the key to optimizing your content is to use the question in the most strategic positions like headings, subheadings, title, and description. And then place the answer to the question in the first paragraph. Example: Here’s how Digital Trends optimized their content for informational intent. 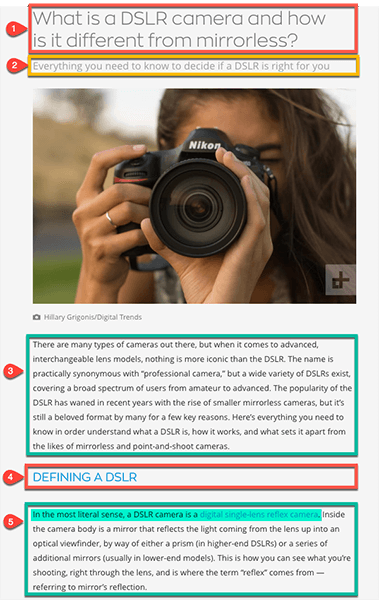 The query – What is a DSLR camera – appears in both the Title and the URL. In the most literal sense, a DSLR camera is a digital single-lens reflex camera. … When the shutter is pressed, that mirror flips up out of the way, the shutter slides open, and light coming from the lens takes a straight shot to the imaging sensor where a photograph is made. The answer appears at the beginning of the Description, followed by more details. But, in this instance, Google has extracted some relevant information from the article (see below) and used it in the search results, to match the search intent better. The page starts with the main heading, but it contains two questions. Immediately after is a subheading to set the context. Then, before answering the opening question, there is a brief history in the opening paragraph. The second subheading leads to the definition. Finally, as highlighted, the question is answered in the second paragraph. Heading 2 – What is Search Intent? Paragraph – Search intent, sometimes referred to as keyword intent, is the underlying reason behind a search query. Use the formulas above to place the question and answer or instruction as close to each other as possible so that the search query is addressed. The key to optimizing for transactional search intent is to keep the content focused on the desired outcome; e.g., buying a product. Design – Make sure the page has white space, images, and no distractions. 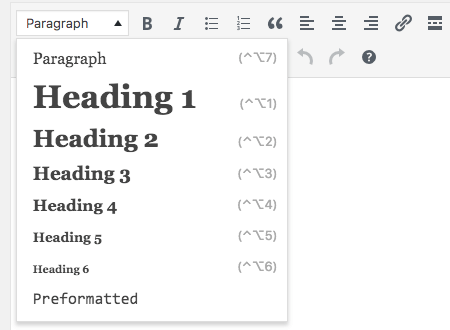 Text – Use lists or bullet points to make the key features scannable. CTA – Use a contrasting color and clear labels on actionable links and buttons. Example: Here’s how Digital Camera World optimized their content for transactional intent. Another benefit of structuring your page like this is to increase the chances of it becoming the Featured Snippet in the SERPs. It’s easier for Google to ‘read’ the page and form a list, as we saw above. The transactional intent is evident in both the Title and the URL. Plus the URL makes it clear that this is a buying guide, as opposed to a tutorial for an informational search. The Description starts with a date stamp to prove the information is relevant and up to date. Then it reiterates the key phrase before listing the products. 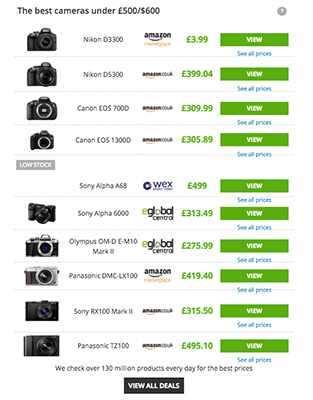 When you see this search information, there’s no doubt that you’re going to get a list of the ten best cameras under £500. Using the right kind of words both on your page and your meta information gives a clear signal to search engines that you’ve created a transactional page. Specific products; e.g. Canon EOS 700D, Nikon D5300. Product categories; e.g. DSLR, Mirrorless, Compact, Lenses. Use the right words, at the right time, in the right place to ensure your message is clear. Direct searchers to their end goal with scannable content and distinct CTA buttons. 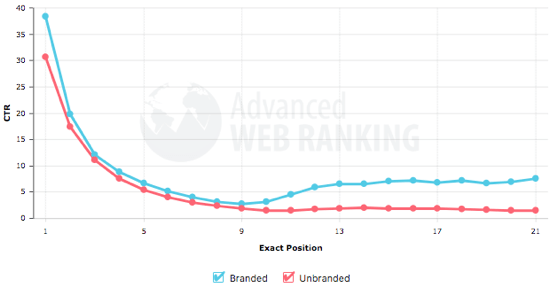 Now it’s time to check if you’ve optimized your content for search intent. There’s a high chance you can improve your existing pages and configure them to match the applicable search intent. Use Google Search Console and Google Analytics to evaluate your existing content, and remember to combine search intent with keyword research when you create new content.